I did a thank you card, for all the inspiration I’ve gotten from Card Patterns. Thank you Michelle and Tracy! You have done a fabulous job running this challenge, and I loved being on the design team for the past 6 months. Lots of layered circle elements on this card. I made two rosette flowers and stacked them on top of each other, finishing the top one off with Crackle Accent in the centre, and smearing some Rock Candy Stickles on both of them. 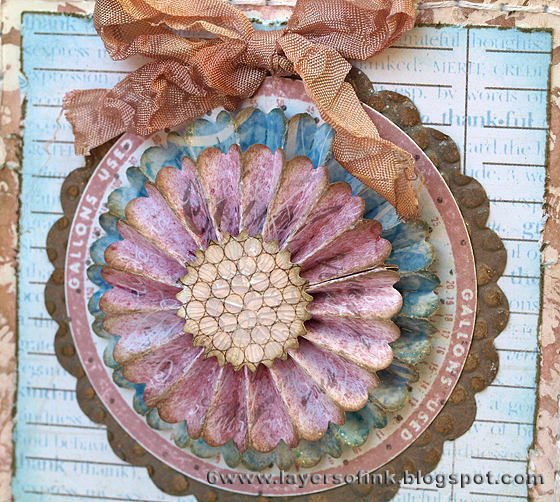 I discovered that the large flower fit perfectly into the stamped circle from the new Road Trip stamp set from Tim Holtz. It is a car themed stamp, but I love the frame it gave to the flower. It was stamped on patterend paper with Victorian Velvet ink. I finished the layered circle elements off with a dry embossed and sanded kraft core scalloped circle. 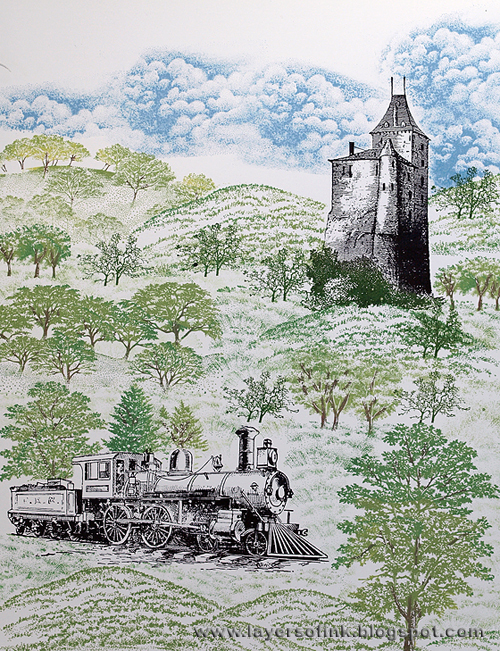 The background was made by stamping the Fabric Design stamp with white paint. After it dried, I inked it with Victorian Velvet and Frayed Burlap, and misted heavily with Perfect Pearls and water. I stamped the sentiment with Archival Coffee, and a few dots with Frayed Burlap. 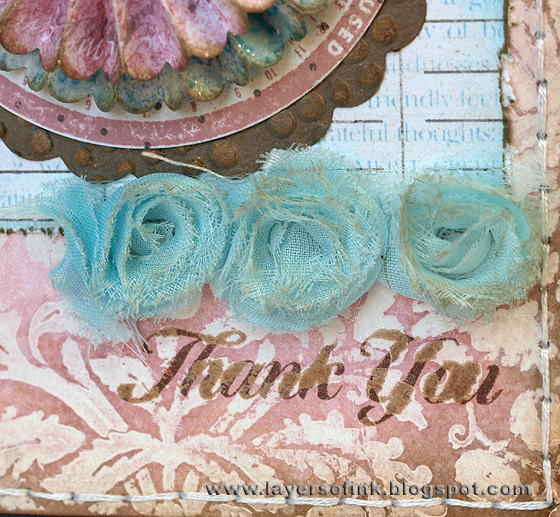 For the square, I stamped a thank you definition stamp with Jenni Bowlin Soap Powder on ledger paper. The crinkle ribbon and roses were dyed with Distress Stains (Victorian Velvet, Frayed Burlap and Tumbled Glass). I love the way the pattern shows through the sentiment. 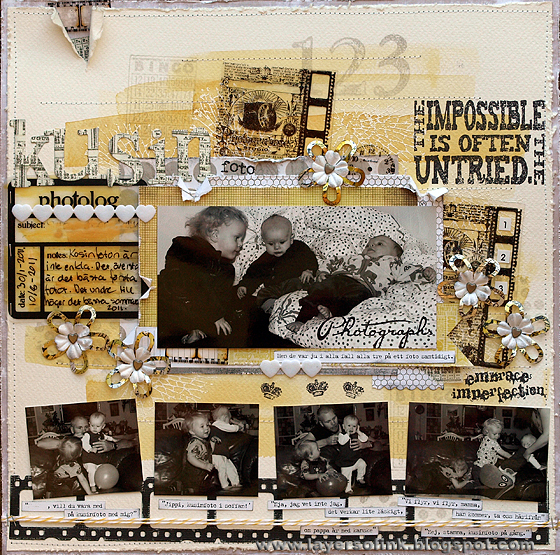 Supplies: Hero Arts: Classic Fabric Design CG245, Find Joy CL497, Cling Dots CG139, sentiment; Stamper’s Anonymous Tim Holtz Road Trip; Sizzix: Paper Rosette Sizzlits, Mini Paper Rosettes Sizzlits, Circle Scallops Framelits, Circle Framelits, Dot Matrix texture fade; Distress Ink: Victorian Velvet, Frayed Burlap; Distress Stain: Victorian Velvet, Frayed Burlap, Tumbled Glass; Adirondack Snow Cape paint dabber; Tim Holtz ideology patterned paper and trim; Crackle Accents; BasicGrey patterned paper. I wanted to use black and white photos with these colours and decided to do a layout about two not very successful attempts at getting posed photos of the three cousins together. There are some reflections in the photo of the layout that are not there in real life, even though I retook them another day. I've been taking photos of my projects at a different time of the day than normally, so the light has been different. 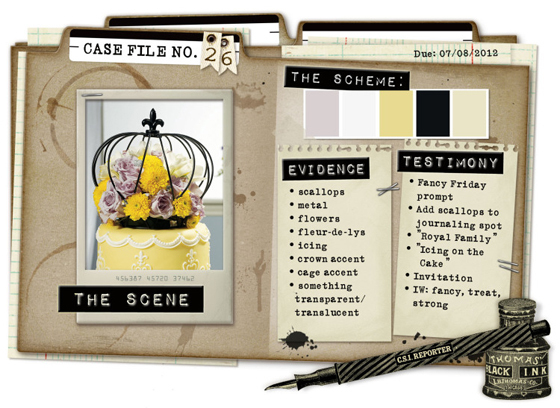 From the evidence items I used: metal, flowers, crown accents, something transparent, scallops. And from the testimony: 'icing on the cake' (write several things about your subject and then finish with the most important one. 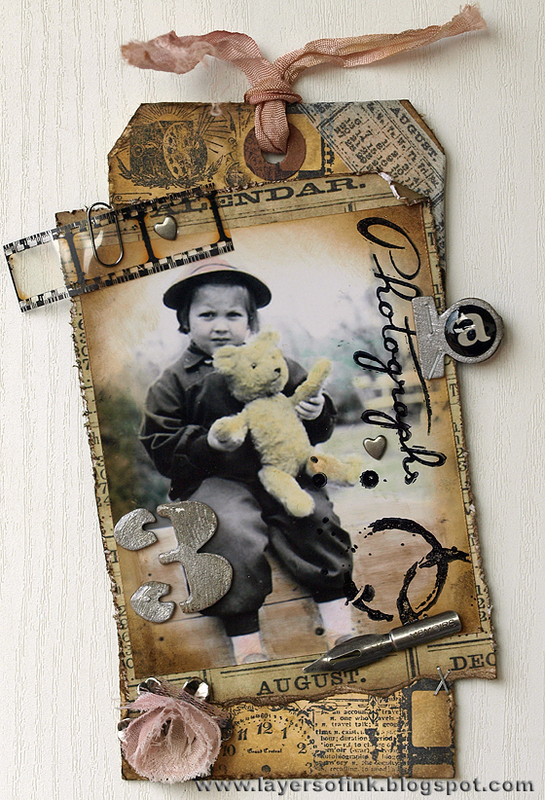 A crackle stamp was white embossed here and there all over the background, for texture. I mixed the two shades of yellow in watercolour paint, and first painted strips of the lighter yellow, let it dry completely (you get ugly runbacks if you skip this step) and then painted strips of the darker yellow. A bingo, dot and number stamp was stamped repeatedly with Versafine Smokey Grey and I stitched extra lines with my sewing machine and white thread. I almost didn’t want to cover the background up. The black stamping was done with Archival Jet Black. 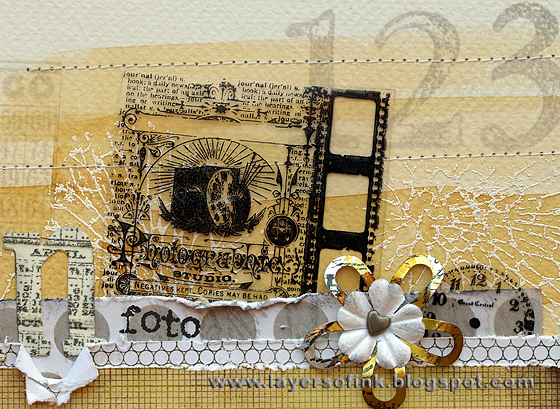 The focal photo was layered on scrap patterned papers and I also stamped on it. I stitched the background to a piece of grey patterned paper, tearing the upper corner first. 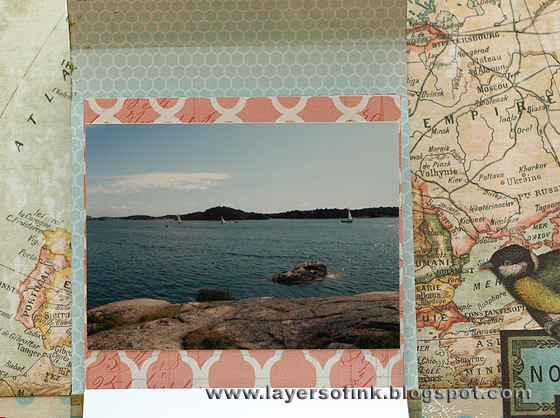 The photo collage ATC stamp was stamped on acetate twice and cut out. The flowers are really old metallic flowers I found in my stash, coloured with alcohol inks (Sunshine Yellow and Butterscotch) and then stamped with a script stamp. I shaped them a bit and added a paper flower and a brad to the centers. I have had those flowers for years, so I was happy to use them. 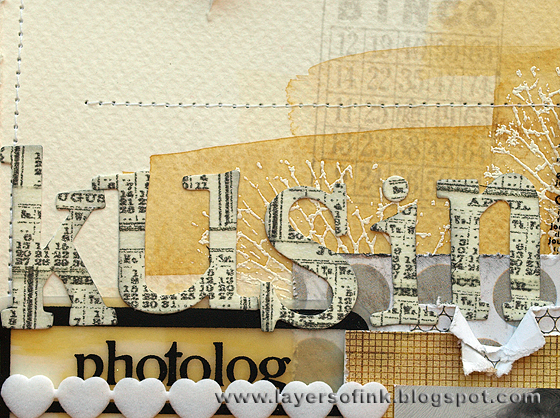 The title letters were die-cut with one of my new favorite dies, Word Play. I’ve been waiting for such a die for a long time, great sized letters and since it is a Bigz die, it can cut through almost anything. I taped strips of tissue tape on scrap cardstock and cut the letters from that, inking the edges a bit. It is a fun way of using tape. Journaling: Cousin photos aren’t easy to take. The top one is the best one from one visit and the one to the bottom right, the best one from a whole summer. 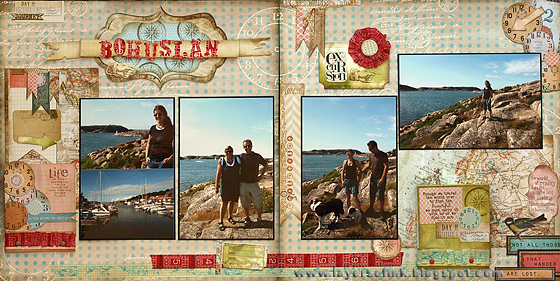 Text strips: ‘Do you want to join me for a cousin photo? Yes, cousin photo in the sofa!’, ‘Well, I am not sure, it seems a bit scary, maybe if daddy is also in the photo’, ‘Flee, flee, mommy, he is coming, take us away from here’, ‘No, stay, stay, cousin photo’. And: ‘At least they were all three in the one photo at the same time’. 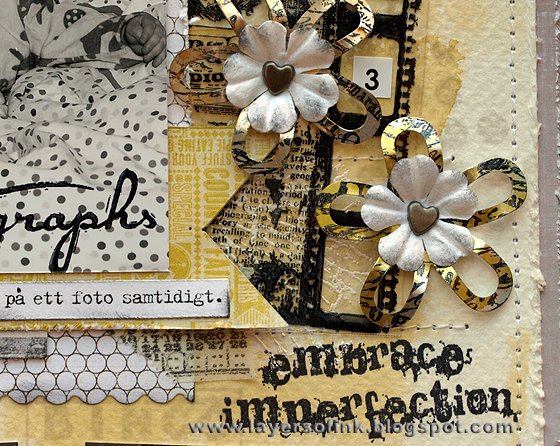 Supplies: Stamper's Anonymous Tim Holtz stamps Attic Treasures, Ultimate Grunge, Warehouse District, Mini Muse, Words for Thought, ATC Photograph stamp: Oxford Impressions number stamps; Making Memories crown stamps; Sizzix: Word Play Bigz XL, Filmstrip Frames Sizzlits; Archival Ink Jet Black; Versafine Onyx Black; Alcohol ink: Sunshine Yellow, Butterscotch; Ranger Seafoam White embossing powder; Tim Holtz idea-ology tissue tape, film strip and patterned paper; Maya Road sheers; Core’dinations kraft core cardstock; Panduro velvet hearts and metallic flowers ; BasicGrey and MME patterned papers; acetate; Daler & Rowney watercolours and watercolour paper; twine. Today I have some awesome news to share. I am very happy to be on the Design Team of Simon Says Stamp and Show challenge! You can find the announcement here. It is going to be lots and lots of fun. The challenges are so varied, and different every week, my head is already full of ideas. Few things sparks creativity as much as a great challenge. I can't wait to get started and play with all my favourite things: stamps, inks, dies, words, paper, paint, and lots of techniques. Hi everyone! Today I have a double layout to share using a bunch of techniques and dies. Sorry about the reflections in some of the photos, I didn’t notice that until they were taken and already edited. 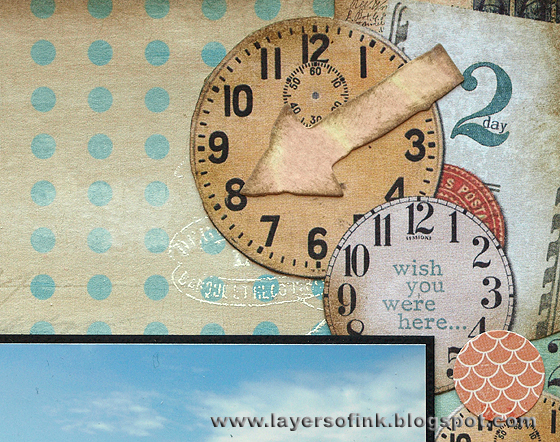 The clock and script stamps were white embossed here and there over the whole background. I wanted to tone down the background a bit, so I covered the entire background patterned papers with Picket Fence Distress Stain, love the chalky look it gives. The matchbooks were cut from double-sided patterned paper. One was inked with Peeled Paint Distress Stain, the other with Victorian Velvet. The die both cuts and scores the matchbooks, making them very easy to assemble. I cut inside pages from patterned paper and filled the books with journaling about this trip as well as with many small photos. I always take lots of photos and write lots of journaling, so the matchbooks were perfect for this. Printed tape was pleated at the base of each matchbook. I used the same tape to make the flower on the second page. Distress Stains (Picket Fence, with either Victorian Velvet or Peeled Paint) were smeared on a craft sheet, a piece of watercolour misted with water was dipped into the ink. From this paper a bunch of die-cuts were made (tickets, small label, arrow) and it was stamped with stamps fitting the theme of the layout. Everything was inked around the edges with Frayed Burlap Distress Ink, and this ink was also used for the stamping on the matchbooks, watercolour paper and label under the title. 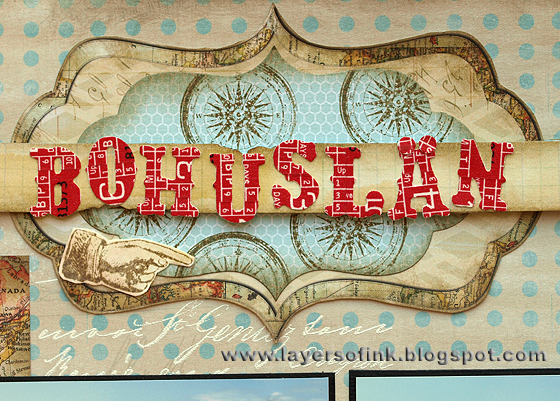 A large banner was die-cut from grid paper, inked with Antique Linen Distress Stain. 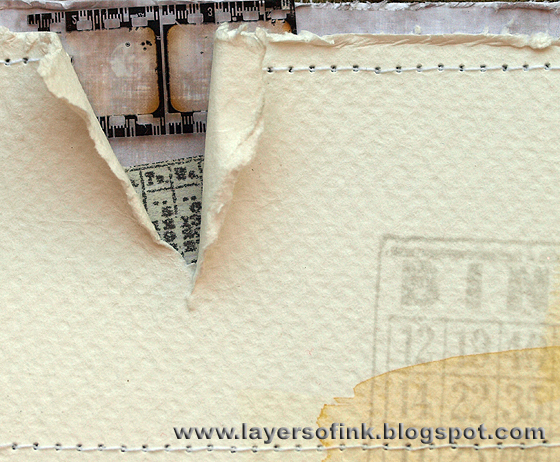 The Styled Label die fit perfectly inside a cut out from one of the journaling cards, so I cut it from pattered paper and stamped with a compass stamp, using Frayed Burlap. Tape was adhered to scrap paper and the title letter were die-cut from it. Love the look of the tape letters. 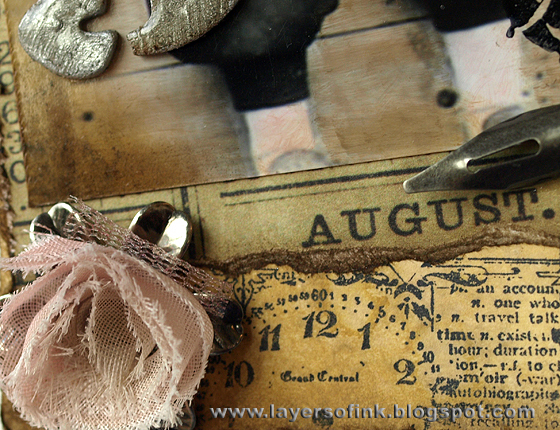 Close-up of the chalky background and white embossing. 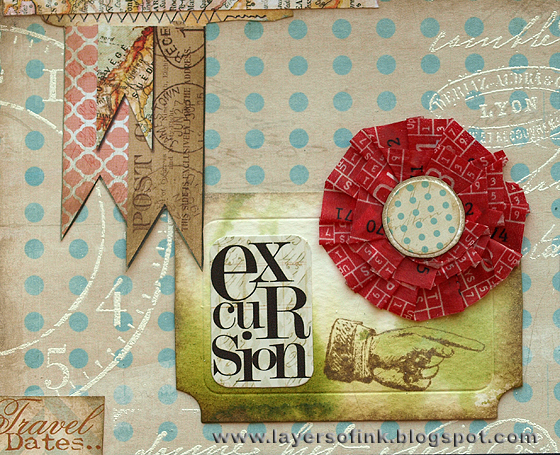 I used details from the patterned papers and journaling cards as embellishments. Lots of clocks, banners, and sentiments. Another corner with layered cut-out papers, a die-cut arrow and a sticker. Supplies: Hero Arts Old Letter CG197, Big Clock CG166; Stamper’s Anonymous Tim Holtz Odds & Ends, District Warehouse; Sizzix: Matchbook Set, Mini Tickets, Mini Labels, Styled Labels, Tattered Banners Sizzlits Vintage Market Sizzlits, Mini Arrow; Bazzill Wayfarer collection patterned paper, stickers, tape and journaling cards; Distress Stain: Picket Fence, Victorian Velvet, Peeled Paint; Distress Ink: Frayed Burlap; Ranger Seafoam White embossing powder; watercolour paper. 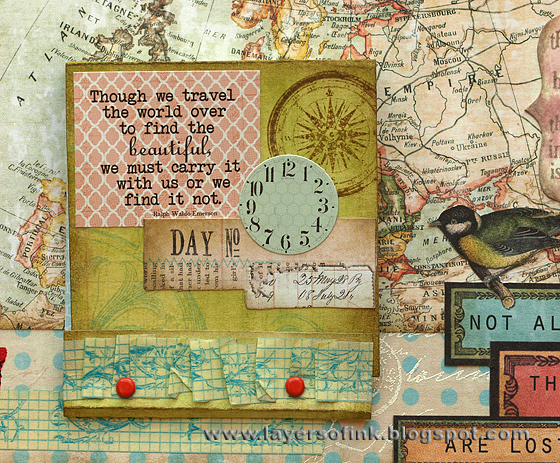 I still have a few World-Wide Stamping Week cards that I haven't shared on the blog yet. 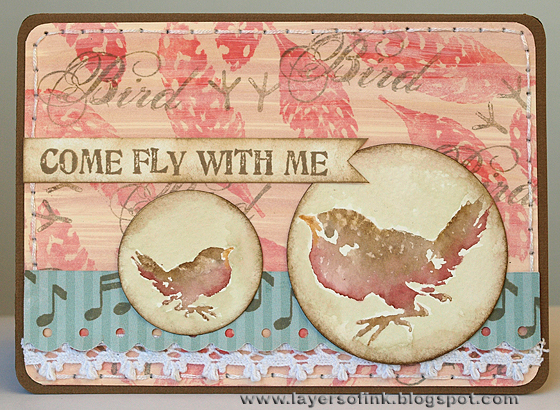 This one was for the Birds of a Feather challenge (to use some type of feather and a bird themed stamp). I didn’t have any feathers at home that fit with the stamps I wanted to use, so instead I used a feather stamp repeatedly on the background. The background is manila cardstock which was first streaked with Distress Stain Victorian Velvet, dried, and then streaked with Picket Fence Stain for a chalky effect. The feathers were stamped with Rose Madder Archival Ink and the text and footprints with Frayed Burlap Distress Ink. I love how the ink sinks below the Picket Fence, making it look as if the feathers are blowing in the wind. The sweet bird stamps are from a set I got from my stamping friend Daria as a RAK. They work so well with the direct to rubber technique. I applied ink with distress markers and misted heavily with water before stamping on watercolour paper. I painted around them with a thin mix of Frayed Burlap and water. The music notes were stamped with Frayed Burlap. TFL!! Supplies: Local King Rubber Stamps Chicks; Oxford Impressions stamps; Sizzix Circle Framelits; Distress Ink: Frayed Burlap; Distress Markers: Victorian Velvet, Aged Mahogany, Rusty Hinge, Frayed Burlap, Vintage Photo, Walnut Stain; Archival Ink Rose Madder; Distress Stain: Victorian Velvet, Picket Fence; Ranger manila cardstock; watercolour paper; MME patterned paper; trim. After having promised to do a tutorial on scenic stamping for a while, I finally remembered to take all the step-by-step photos of the colouring process (I usually forget many of them). I didn’t photograph the stamping process, because it is more dependent on the stamps that you have. You can use the colouring process for almost any kind of scene. 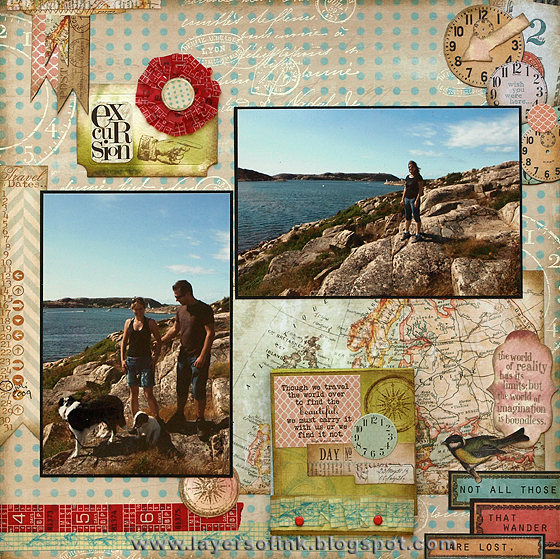 You can find many more tutorials for similar colouring at the Stampscapes site. 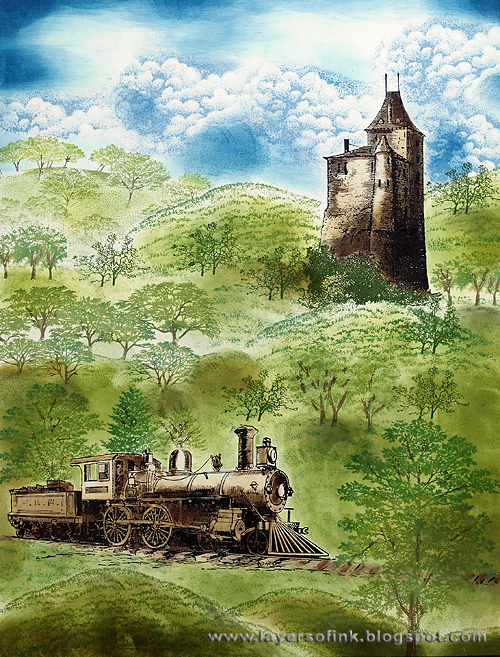 The scene is done on glossy cardstock, and coloured with dye inks. 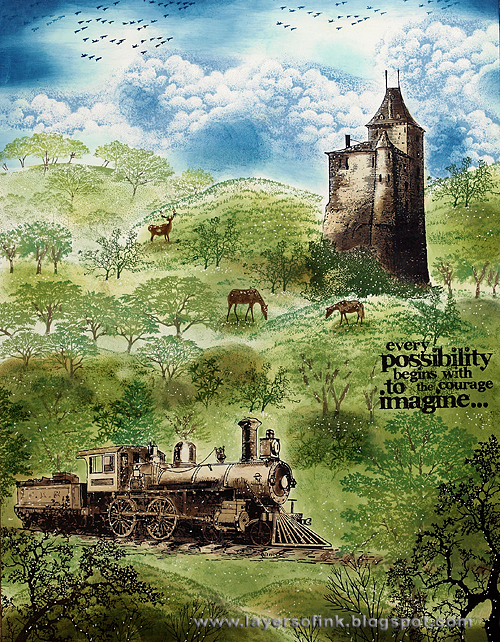 For the stamping, I started out with the train, stamping it with Jet Black ink. I didn’t ink the smoke coming from the train on the stamp, since I didn’t want my son to be sitting in a cloud of smoke. The castle was stamped with the same ink. Next step was to build up the series of hills and for this I used Stampscapes Soft Hill 278F, Oak Row 223F, and Oaks and mist 224F. They were inked with three shades of green ink (Memento Pear Tart, Bamboo Leaves, Cottage Ivy), for variation. I added some brown to the trunks of the trees with a marker. The far off hills were made lighter. 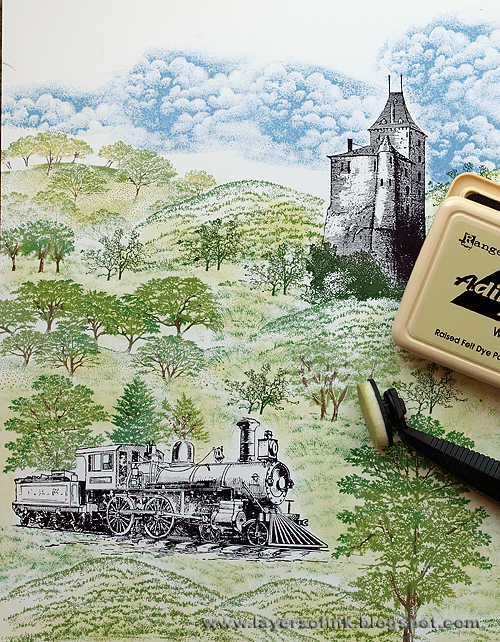 The areas in between the hills were filled in with the Sedge Filler 251C, perhaps my most used scenic stamp. Then I started adding trees here and there, using the same green inks and the brown marker, but also stamping some with Archival Ink Olive. When stamping trees into grass, it looks better if you wipe off some of the ink from the base of the trunk before stamping, then it looks like they are coming out of the grass. I forgot this on a bunch of the small trees, but will fix that later on. 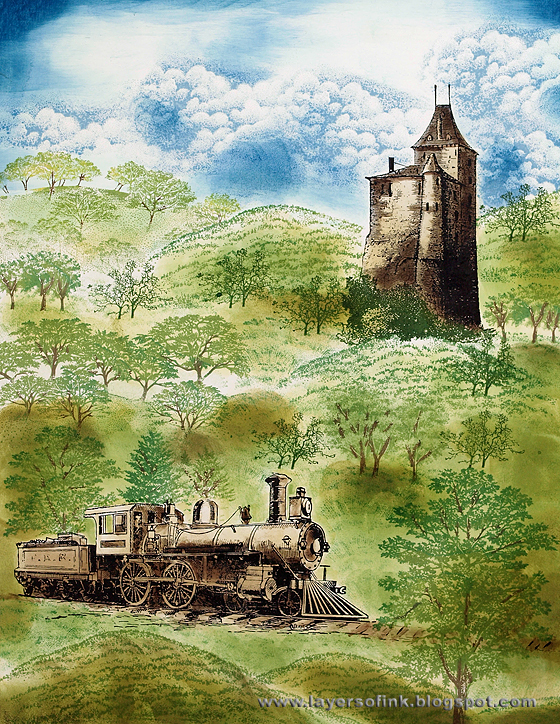 Many mistakes in scenic stamping can be fixed, or won't show once the scene is finished. The Cloud Cumulus stamp was stamped 5 times in the sky with Adirondack Stonewashed ink and wiping off parts of the stamp for variation. I use a Colorbox Stylus Tool when colouring. I love the control you get with this tool and the sponges are awesome. One of the most important things to do when colouring a scene like this, is to start with the lightest shade of ink and then build up colour on top of it. Don't try to put a dark ink as the first layer, not only will it usually not go on smoothly, but there is also very little you can do to make it lighter. You can always add colour, but not remove it. Since dye inks are transparent, the layers underneath show through, so if you ink a light colour on top of a dark one, it will usually not show much. 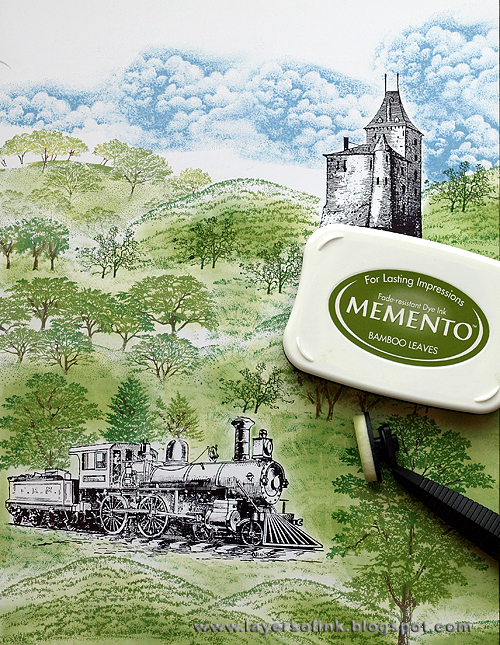 A first layer of light coloured ink also lubricates the paper and makes it easier to apply the darker ink smoothly. I like to start with Adirondack Willow for green areas, making sure to leave some areas the white of the paper. You can use the tool in a tapping or dragging motion, and turn it on its side for narrow places. Next I added some Bundled Sage here and there. Next Bamboo Leaves, don't cover all the previous ink. I added almost no ink to the areas just beyond the hills, to increase the sense of a hilly landscape. I didn't add any of the darker greens to the far off hills, if they are lighter, it looks like they are further away. It is important not to colour the scene in the same shade all over, but to have different values of each colour. I added some Peeled Paint to the darker areas of the grass. And finally I added Adirondack Oregano and Pesto for the dark areas of the grass. If the foreground is made darker, it jumps forward in the scene, adding perspective. Dark areas are also found around the edges of the scene, behind the castle, and underneath some of the trees. 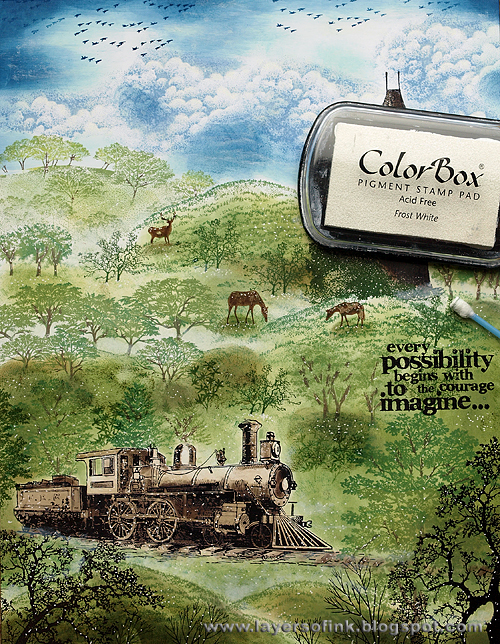 These inks are a brown-green shade and grass usually looks better if you add some brown to it. 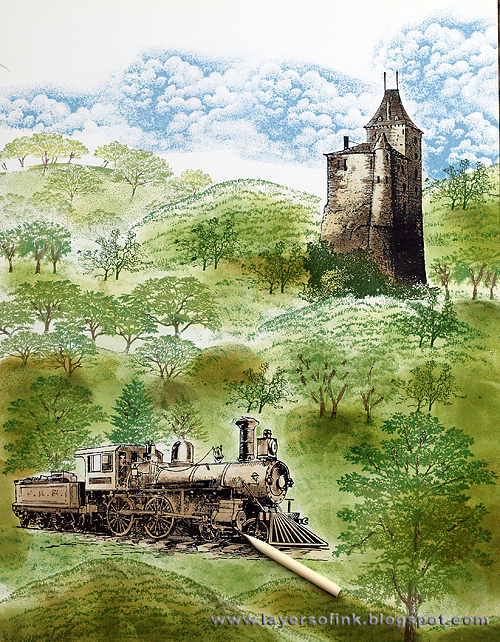 Next, Antique Linen Distress Ink was used as the first layer of ink on the train and on the castle, it is so light that you hardly see it, but still important to add. 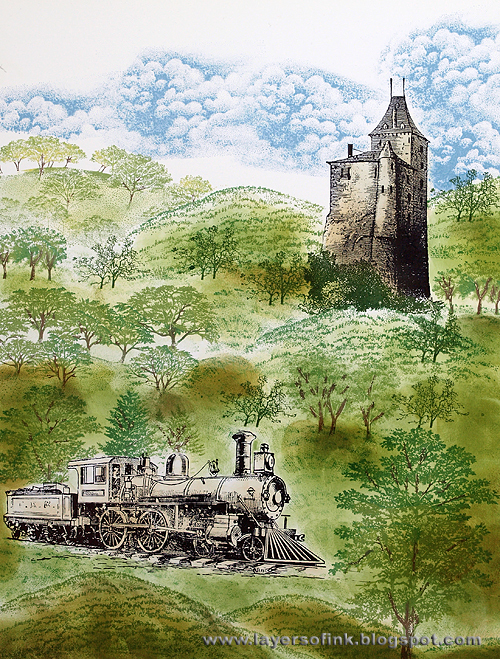 Adirondack Mushroom was used as the next layer ink on the train and castle, leaving quite large areas uncovered. I use a Ranger craft nib for the narrow places when colouring. There is a handle available now, but I couldn't find mine when doing this scene, so I only used the nibs. Before colouring, decide where the light is coming from, so that you know where to place shadows and highlights. Finally, Adirondack Espresso was added to the shadow areas of the train and the castle. It is a dark brown ink. Now, to the sky. I often colour the sky first, but this time I started with the grass, since there was so much of it. For blue areas (sky and water), Adirondack Aqua works great as a first layer. It is a very light shade of blue, you hardly see it in the photo. I left large areas of the sky the white of the paper. The next blue added to the sky was Adirondack Stonewashed, one of my favorite shades of blue. The ink was applied in a streaky fashion, starting from the edges of the paper. This adds movement to the sky. I also added some of the ink to the shadow parts of the clouds. A bit of Adirondack Denim was applied to the corners of the sky. 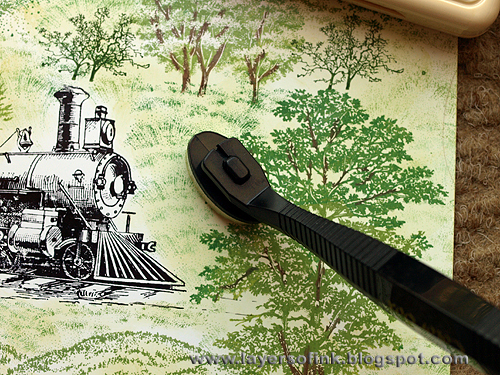 I used a black pen and brown ink to extend the track of the train. It looked strange when it just disappeared into the grass. When dye inks dry, they become lighter, much like watercolour paint. I often leave my scenes to dry overnight, and then add some more ink to them the next day, starting with a layer of the lightest ink and then adding some dark ink. After the scene is coloured, I often add some more stamping. The Migrating Birds were stamped with Denim ink. I usually stamp birds to the sky after colouring it, because they can be used to cover up little mistakes if necessary. 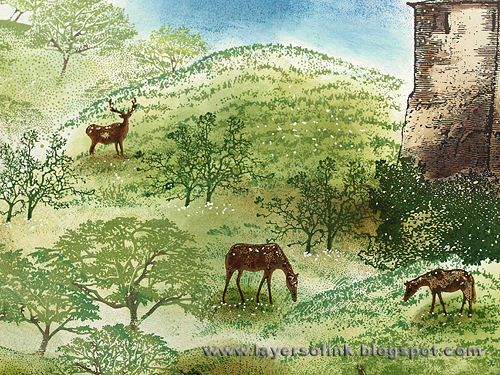 I wanted to add some more life in the scene and the horses and buck were stamped with Archival Ink Coffee. I use a stamp positioner for a lot of the last step stamping, because I don't want to mess up a scene that I have already coloured with crocked stamping. It is also helpful to test the placement of things by stamping them on the transparent sheet of the stamp positioner, and then moving it around, especially to check that they are not out of proportion, too large or too small relative to the other items in the scene. 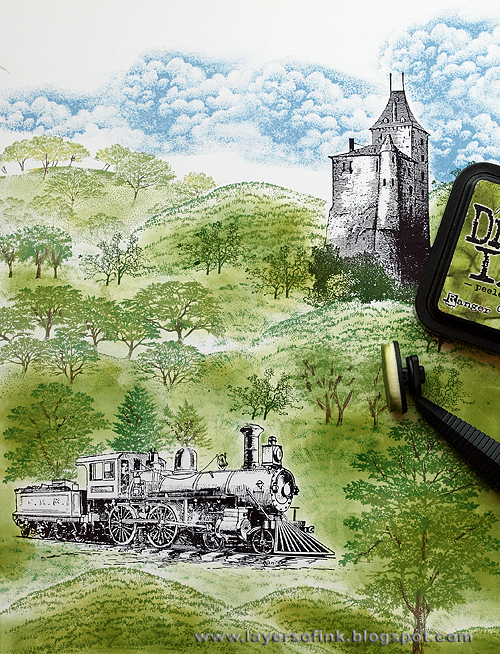 The Sedge Filler stamped was stamped with a dark green ink here and there on the grassy areas, to add more texture. 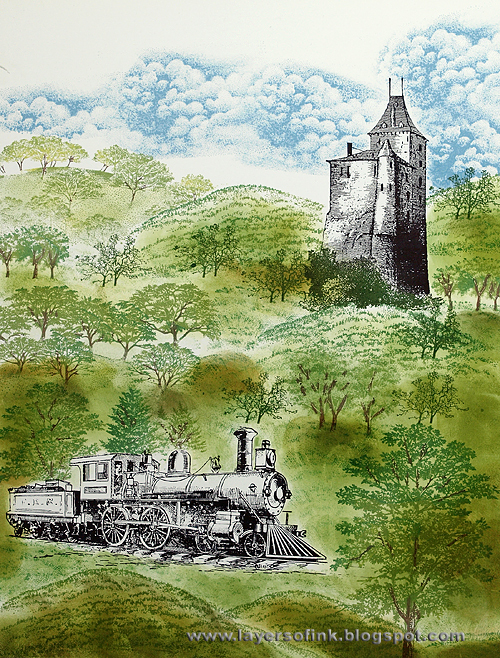 Trees were stamped in the foreground with Jet Black ink to frame the scene and to make the foreground darker. Highlights were added with a white gel pen. I also used the pen to add little white flowers to the grass here and there. Here's a close-up of the highlights. I added extra flowers under the trees where I had forgotten to wipe of the ink at the base before stamping. The flowers made the trees look more anchored to the grass. The final step is to add mist and some 'shine' with white pigment ink. 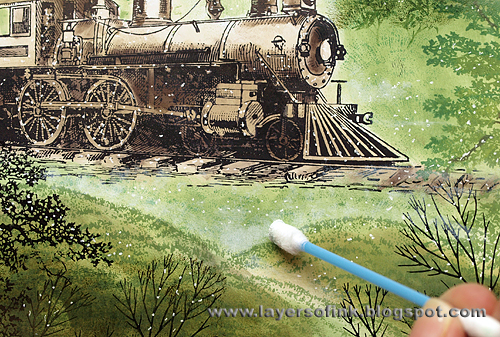 Dry-brush the ink on to the scene, making sure not to add too much ink at a time. I placed the white ink in between the hills to increase a sense of distance, as well as in the sky and on the clouds. The finished scene. I sprayed it with a light coat of gloss fixative at the end. Thank you so much for looking at this long tutorial. Let me know if you have any questions. Supplies: Stampers Anonymous Tim Holtz On the Railroad, District Warehouse; Beeswax castle; Stampscapes: Buck 008A, Cloud Cumulus 018E, Foliage 035A, Migrating Birds 152D, Spotted Horse 155A, Horse 171A, Oak Tree Sm. 177B, Oak Branch 203G, Oak Row 223F, Oaks and mist 224F, Maple Pair 239D, Maple Trio 240B, Shagbark Hickory Sm. 241E, Shagbark Hickory 242G, Tree Cluster 244E, Sedge Filler 251C, Tal Grass Sm. 254B, Prickly Branches 272G, Soft Hill 278F. Inks: Adirondack: Willow, Aqua, Stonewashed, Oregano, Pesto, Espresso, Mushroom, Denim; Distress Ink: Bundled Sage, Frayed Burlap, Peeled Paint, Antique Linen; Memento: Bamboo Leaves, Cottage Ivy, Pear Tart, Rich Cocoa (ink and markers); Archival Ink Jet Black and Coffee; Colorbox Frost White. Other: white gel pen: Kromekote glossy cardstock; Colorbox Stylus Tool, Ranger craft nibs. The background was done by streaking Tumbled Glass and Stormy Sky Distress Stains across a piece of manila cardstock, and then finishing off with streaks of Picket Fence. I stamped on top with Stormy Sky. The gears were die-cut from grungeboard and painted silver. 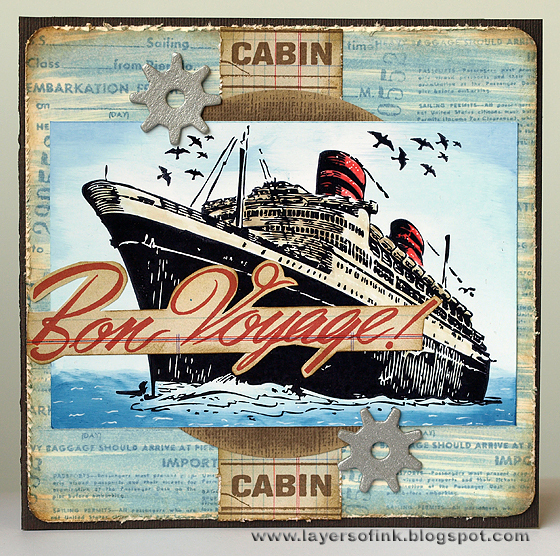 There is unfortunately a reason for why this is a Bon Voyage card. 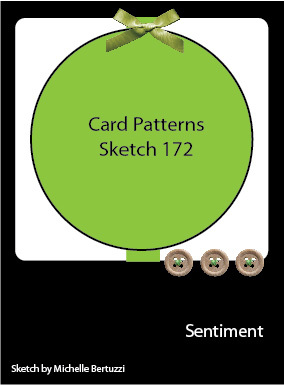 This is the second last Card Patterns sketch, since the challenge will be closing down after the next sketch. I have played along in the challenge for a long time, and I have very much enjoyed being on the DT, so I am going to miss it very much. 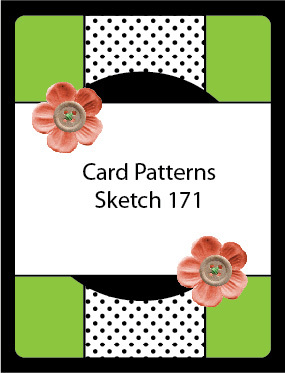 I hope you can play along with us for these two last sketches, so that we can give Card Patterns a proper good bye. A big thank you to Tracy and Michelle for all the inspiration since 2008, and for wanting me to be on the design team. 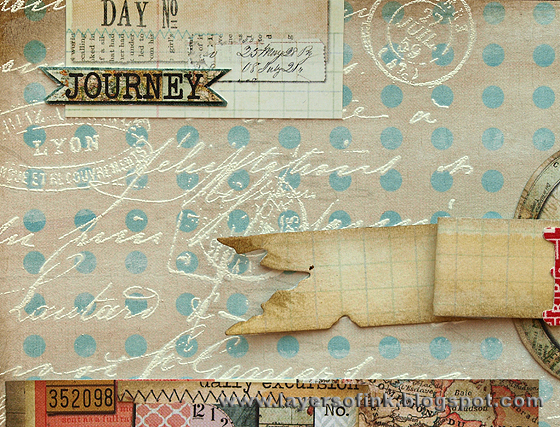 Supplies: Stampers Anonymous Tim Holtz Artful Voyage, Mini Ornates; Sizzix Mini Gears Movers & Shapers; Distress Stain: Picket Fence, Tumbled Glass, Stormy Sky; Distress Ink: Festive Berries, Antique Linen, Frayed Burlap; Adirondack: Aqua, Stonewashed; Archival Ink Jet Black, Vermillion and Coffee; MM ledger paper; grungeboard; Adirondack silver dabber; Ranger Specialty Stamping Paper. 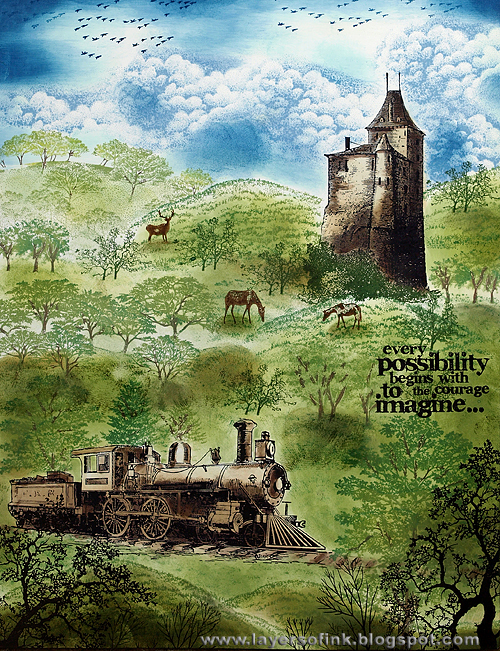 When I saw the photo and the colours I immediately knew I wanted to do a piece of scenic stamping. This is the fourth full-sheet (8.5x11in) layout I make for my son where I place him into the scene, together with some journaling (in this case a stamped sentiment and some more text behind the layout). You can find the others here, here and here. 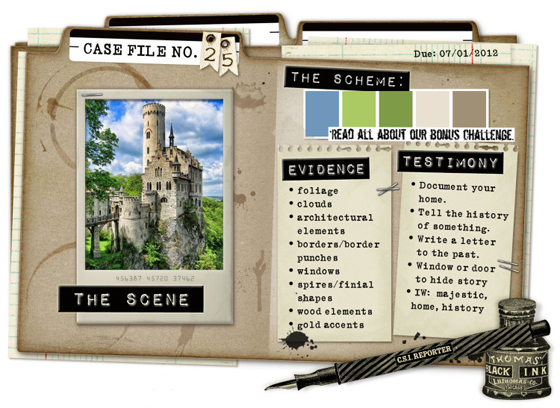 From the evidence items I used: architectural elements, foliage, clouds, shadows. From the journaling items I was inspired by the word ‘majestic’. 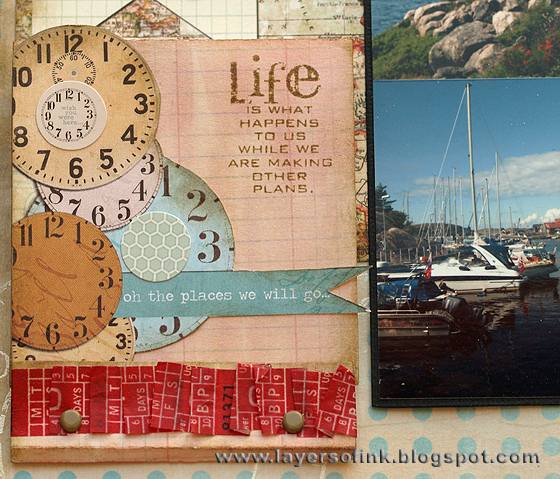 I added a journaling page behind the layout, writing about the importance of having the courage to imagine. The scene got just the reaction from him I expected, since this looks like exactly something my son would want to do in real life: he immediately said that he wants to ride a train too. After having promised to do a tutorial on scenic stamping for a while, I finally remembered to take all the step-by-step photos of the colouring process (I usually forget many of them). I will post the tutorial tomorrow, I just need to write the text. Inks: Adirondack: Willow, Aqua, Stonewashed, Oregano, Pesto, Espresso, Mushroom, Denim; Distress Ink: Bundled Sage, Frayed Burlap, Peeled Paint, Antique Linen; Memento: Bamboo Leaves, Cottage Ivy, Pear Tart, Rich Cocoa (ink and markers); Archival Ink Jet Black and Coffee; Colorbox Frost White; white gel pen: Kromekote glossy cardstock. 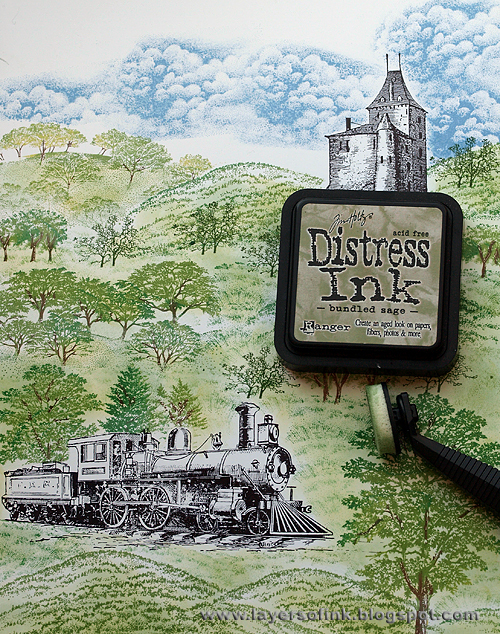 The photo was tinted with Distress Inks and craft nibs (I use these a lot for my scenic stamping too). I made the bear yellow, because I think it was yellow (Scattered Straw), there are colour photos of it from when I was a baby. The hat and socks are pink (Victorian Velvet) and I used Frayed Burlap and Walnut Stain on the wooden box she is sitting on. The edges were tinted with Vintage Photo and Walnut Stain and I added some Bundled Sage and Pine Needles to the grass and bush areas of the photo). The photo was matted on calendar patterned paper, placing the word ‘August’ under the photo since that is my mom’s birthday month. The background was made with Picket Fence, Scattered Straw and Frayed Burlap Distress Stain, loved how it turned out, so I think I need to use that combination again, because my photo was pretty big, so not much of the background shows. 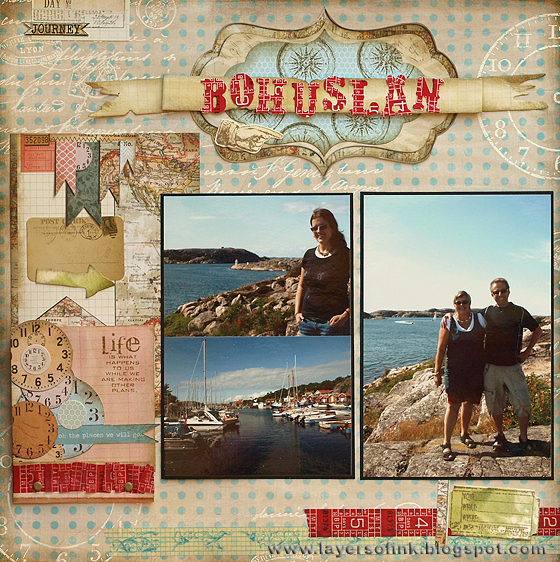 I stamped it with a photograph collage stamp. The ribbon rose was dyed with Tattered Rose and Victorian Velvet and placed on top of a metallic flower I found in my stash. The crinkle ribbon is dyed with Victorian Velvet and Frayed Burlap and misted with Perfect Pearls. The ‘3’ was die-cut from grungeboard using the Cargo Stencil dies, painted silver, distressed a bit and inked with Walnut Stain, and then covered with Glossy Accents. 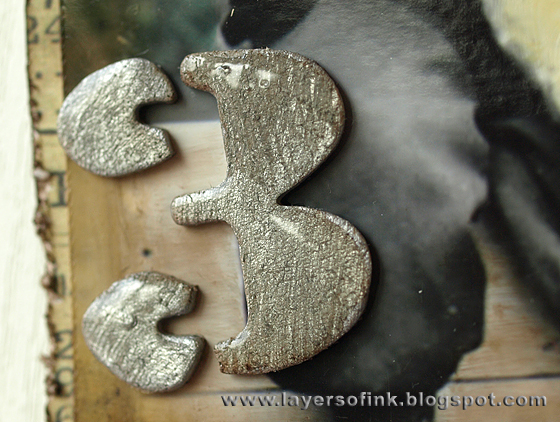 The tab was also die-cut from grungeboard using the Tiny Tabs & Tags die and painted silver. I punched a black circle from cardstock, added a white letter sticker on top and coated with Glossy Accents. Supplies: Stamper’s Anonymous Tim Holtz stamps: Mini Muse, District Warehouse, ATC Photograph stamp; Sizzix: Cargo Stencil Numbers Movers & Shapers, Tiny Tabs & Tags; Distress Stain: Picket Fence, Frayed Burlap, Tattered Rose, Victorian Velvet, Scattered Straw; Distress Ink: Frayed Burlap, Scattered Straw, Bundled Sage, Pine Needles, Victorian Velvet, Vintage Photo, Walnut Stain; Archival Ink Jet Black; silver paint dabber; grungeboard; Tim Holtz film strip, patterend paper, ribbons, and metallic embellishments. I was so happy today when I saw that my Krafty Owls card was one of the June first round Fab Five winners at Hero Arts! The other winning cards are absolutely stunning, you can see them all here. I had lots of fun making my kraft card, especially since I rarely do quick and simple type cards. I love the look of Colorbox Frost White stamped on kraft. Thanks so much to Hero Arts for picking my card as a winner!